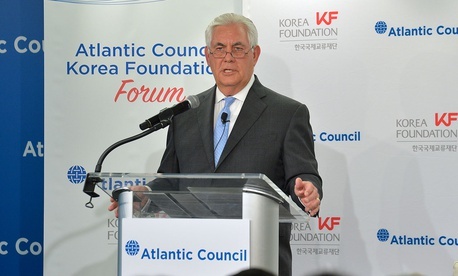 Administrations are allowed to adopt new strategies, of course, and were Tillerson on the same page as his boss, his latest statement would mark a significant shift in the Trump administration’s position. Yet in response to Tillerson’s remarks, White House press secretary Sarah Huckabee Sanders said the administration’s stance had not changed. Tillerson’s words yesterday probably threw Japanese prime minister Shinzo Abe for a loop. Abe was preparing to convey to UN secretary-general Antonio Guterres—in Tokyo for a health-care conference—his opposition to talks with Pyongyang, and the need to apply maximize pressure on the regime of Kim Jong-un. Last week, the UN, which favors dialogue, sent its political-affairs chief Jeffrey Feltman to Pyongyang for talks. North Korea is a big subject to be disagreeing on.